The Rock Ultra full size HC is built in the classic 70 series design and delivered with our precision engineering standards and first rate upgrades. This pistol is chambered in 10mm with a 5" button rifled barrel supported by a full length guide rod. It includes a double stack magwell with a 16-round capacity. Smooth angled, snag-free styling allows for quick draw in fast need situations. This firearm features a low profile adjustable rear sight and high visibility fiber optic front sight and includes a skeletonized hammer and trigger with adjustable over travel stop and ambidextrous safety. The Rock Ultra is finished with a tough, parkerized matte coating and battle-ready G10 tactical grips. 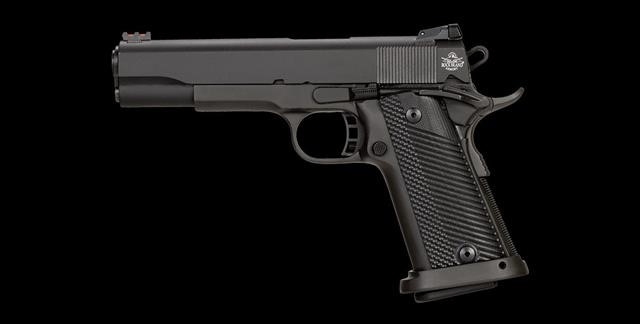 True to all Rock Island 1911s, the Rock Ultra comes with a crisp factory 4- to 6-pound trigger, which gives you a great experience right out of the box.